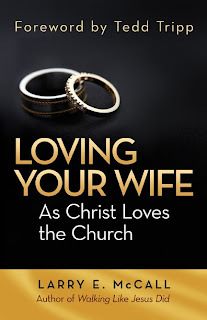 Just in time for Valentine’s Day, BMH Books is pleased to announce the availability of Larry McCall’s newest book, Loving Your Wife as Christ Loves the Church. McCall, the author of the popular BMH book Walking Like Jesus Did, in this new book delivers a powerful message for men who did not grow up with dads who were good role models, or for men who need to be reminded that Christ is the perfect husband to His bride, the church. Larry McCall, a graduate of Grace College and of Grace Theological Seminary in Winona Lake, Indiana, has also earned his doctorate from Trinity Evangelical Divinity School. Since 1981 he has pastored Christ’s Covenant Church in Winona Lake. He and his wife, Gladine, have three married children. The 200-page paperback retails for $15.99, and quantity discounts are available. The ISBN number is 978-088469-304-8. To order, log onto www.bmhbooks.com , call (toll free) 1-800-348-2756, or contact your online or local bookseller.